The spiritual practice can be said to consist partially of meditation, partially of Dream Yoga. Meditation and Dream Yoga are two sides of the same thing. If you nevertheless should try to discriminate, then you about meditation can say, that the three aspects of meditation are relaxfullness, awareness and heartfullness. These three aspects are trained through supporting exercises such as relaxation, Hara practice, as well as Tonglen practice (see the supporting exercises in my book Meditation as an Art of Life – a basic reader). A lot of philosophers within European philosophy have also claimed, that life is a dream, or that the whole world is our own construction, created either by sensation or thinking. The best known examples are probably George Berkeley and René Descartes. In European philosophy there is namely a strong tradition for only reckoning with two forms of cognition: sensation and thinking. Berkeley reckoned with sensation, whilst Descartes reckoned with thinking. Berkeley is famous for the sentence Esse est percipi, which means that being, or reality, consists in being percepted (to be is to be experienced). The absurdity in Berkeley´s assertion is swiftly seen: If a thing, or a human being for that matter, is not being perceived by the senses, then it does not exist. In accordance with Berkeley there therefore does not exist any sense-independent world. He ends in the so-called solipsism. That we will return to. Descartes was also very dubious concerning how much we can trust our senses. Therefore also he took up the question Is life a dream? However his intention with this was in his Meditations to develop a confident cognition-argument. In his Meditations Descartes presents the problem approximately like this: I frequently dream during the night, and while I dream, I am convinced, that what I dream is real. But then it always happens, that I wake up and realize, that everything I dreamt was not real, but only an illusion. And then is it I think: is it possible, that what I now, while I am awake, believe is real, also is something, which only is being dreamt by me right now? If it is not the case, how shall I then determinate it? Both the Brain-in-jar Hypothesis and the Dream Hypothesis are important in the ideology I call The Matrix Conspiracy (see my article The Matrix Conspiracy). An important pedagogy of The Matrix Conspiracy is namely subjectivism and relativism, which claim, that there doesn't exist any objective truth. Truth is something we create ourself, either as individuals or as cultures, and since there doesn't exist any objective truth, there doesn´t exist any objective scale of truth. Everything is our own thought-construction. Let us try to look at three logical problems, which the Dream Hypothesis runs into: The infinite regress, the solipsism, as well as the polarization-problem. I presuppose, that I - with the assertion about, that what, I now call reality, is a dream - believe, that it in principle is possible, that I wake up from it and realize, that it only was a dream. In that case I shall after all find myself situated in a new reality, which relate ifself to what I now call reality, as this relate ifself to my nightly dreams. This ”new reality” you could then term ”the R-reality”. When I wake up to the R-reality, I realize, that what, I till then called reality, only was a dream. But using the Dream Hypothesis (whatever argument I might have for it) I must already now conclude, that the R-reality also could be a dream, which I, if I some day wake up from it, shows ifself to be contained in a R-R-R-reality – and in this way I can keep on. If i say, that reality is a dream, and therefore ought to be called ”dreamt reality”, yes then I can not find any argument against, that it is a ”dreamt dreamt reality” or a ”dreamt dreamt dreamt reality” etc., indefinitely. The Dream Hypothesis can for example only be stated in first person. There are not two persons who can agree about it, because all other persons than the person, which put forward the Dream Hypothesis, ex hypothesi are dream phenomena in his dream. When I – in first person – analyzes the eventual arguments against the Dream Hypothesis, I realize, that I don´t need to take them seriously, because they ex hypothesi only are dream phenomena, which can´t be compelling. But at the same time I realize, that all my arguments for the Dream Hypothesis for the same reason nor can be considered compelling. I have ended up in a self-contradiction. Reality seems to be an Otherness, which determines and defines the world – that is: a negation-principle. Any concept, any thing, is defined by its negation; that is to say: what it not is. A dream can in other words only be defined from what it not is. It is for example not reality. This logic seems to be impossible to get around. How can you altogether assert that life, or reality, is a dream, unless you know what a dream not is? 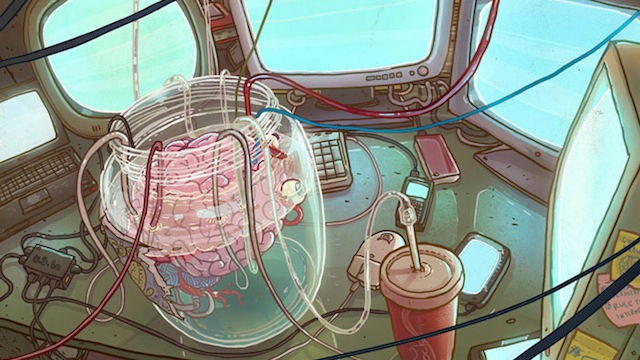 The Brain-in-jar Hypothesis runs into exactly the same logical problems. To the common consciousness, or the common cognition - that is to say: sensation and thinking - life could very well be thought to be a dream. The wholeness could possible be sleeping. You could here very well imagine the validity of the above problems, but you end up in the three logical problems. It is precisely these logical anomalies, paradoxes and problems, which create Samsara´s wheel of eternal repeating up-cycles which is followed by eternal repeating down-cycles and vice versa (for example life and death, success and fiasco, joy and sorrow) – as well as the ignorance and the suffering when you are caught into this wheel, for example in the experience of nightmare and anxiety. All Jorge Luis Borges´ small stories are about these logical and philosophical problems. His stories are filled with mirrors, masks, endless series and regresses, labyrinths, doppelgängers, time, solipsisms and dreams (I have examined these logical and philosophical problems in my book A dictionary of thought distortions, especially in the thought distortion I call Endless split of the thought). At first Chuang Tsi´s text seems to be even more radical than Descartes. But what you can say, is, that there is a radical difference between Chuang Tsi and Descartes. Descartes and Berkeley reckoned namely, as before mentioned, only with two forms of cognition, sensation and thinking. Chuang Tsi, as well as Medieval philosophers and a lot of Catholic philosophers in the present day, however speak about revelation as a third cognition-form. Some of our temporal existentialists speak about a type of being-cognition, which neither is due to sensation or thinking. And finally a couple of European mystics, as for example Plotin, Meister Eckhart and William Blake, have spoked about an occult cognition of God and higher powers, which reaches far beyond the areas of sensation and thinking. You could term it the wholeness-cognition. And in the East (for example Chuang Tsi) such a third cognition is well known (see my article Paranormal phenomena seen in connection with mystical experiences). The truth in this awakenness - and which of course also is there hidden, both when the wholeness is dreaming and sleeping - is precisely the instance which creates the logical, and insoluble problems with theories which only work with two forms of cognition, sensation and thinking.